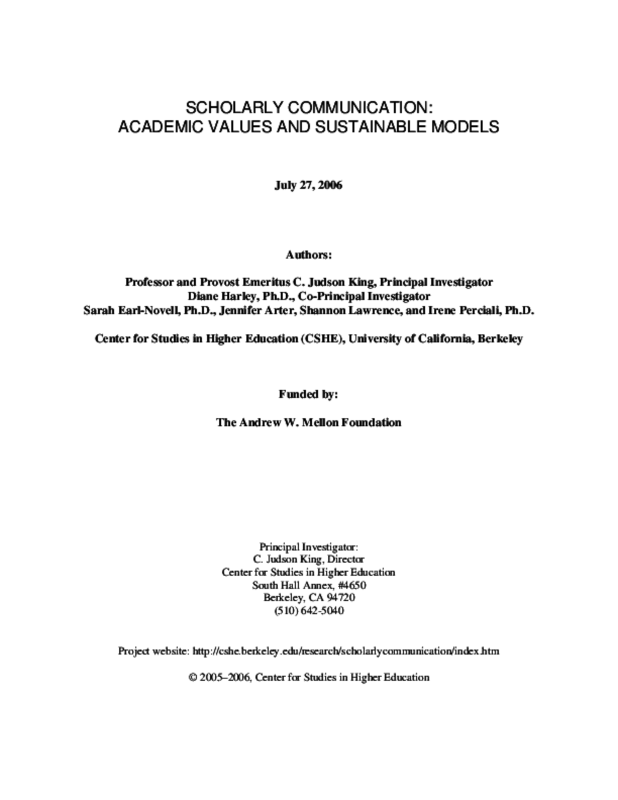 This report presents five thickly-described interdisciplinary case studies that explore academic value systems as they influence publishing behavior and attitudes of University of California, Berkeley faculty. The case studies are based on direct interviews with relevant stakeholders -- faculty, advancement reviewers, librarians, and editors -- in five fields: chemical engineering, anthropology, law and economics, English-language literature, and biostatistics. The results of the study strongly confirm the vital role of peer review in faculty attitudes and actual publishing behavior. There is much more experimentation, however, with regard to means of in-progress communication, where single means of publication and communication are not fixed so deeply in values and tradition as they are for final, archival publication. We conclude that approaches that try to "move" faculty and deeply embedded value systems directly toward new forms of archival, "final" publication are destined largely to failure in the short-term. From our perspective, a more promising route is to (1) examine the needs of scholarly researchers for both final and in-progress communications, and (2) determine how those needs are likely to influence future scenarios in a range of disciplinary areas. A "build it and they will come" approach to many university digitization initiatives has precluded systematic investigations of the demand for these resources. Those who fund and develop digital resources have identified the general lack of knowledge about the level and quality of their use in educational settings as pressing concerns. This full report describes our research and the complete results of a large 2-year study. 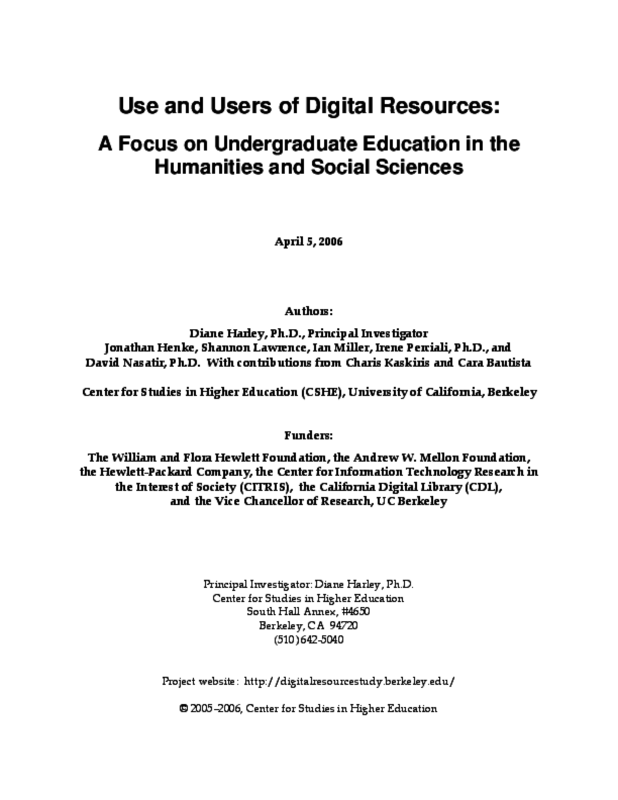 The purpose of our research was (1) to map the universe of digital resources available to a subset of undergraduate educators in the humanities and social sciences, and (2) to investigate how and if available digital resources are actually being used in undergraduate teaching environments. We employed multiple methods, including surveys and focus groups. Our definition of digital resources was intentionally broad and included rich media objects (e.g., maps, video, images, etc.) as well as text. As the large lecture course continues to be a component of many college programs, the potential of online technology to enhance such courses remains a question for researchers. To what extent can such technology result in saving financial resources and teaching time? How do students attending lectures respond to online course components? Does such technology have a noticeable impact on student performance and remote learning? In a study conducted at the University of California (UC), Berkeley, authors Diane Harley, Jonathan Henke, and Michael W. Maher compared traditional and technology-enhanced versions, including video lectures streamed over the internet, of an undergraduate chemistry course over a two-year span. In their findings, the authors indicate significant potential savings of money and teaching time after the second year as well as positive student attitudes towards the technology. Although the technology-enhanced version of the course did not result in any noticeable differences in student performance, the authors conclude that the benefits of online technology for large lectures remain substantial, particularly in providing stressed students with flexibility in their use of time and space, including viewing lectures remotely while preparing for exams. 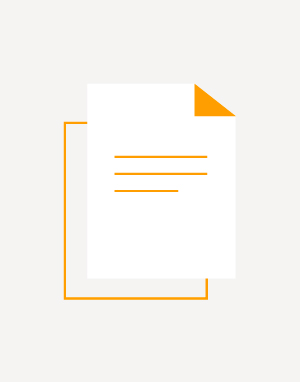 With respect to fully realizing significant institutional cost-savings, however, more faculty members would need to share and reuse course materials than is currently the case. 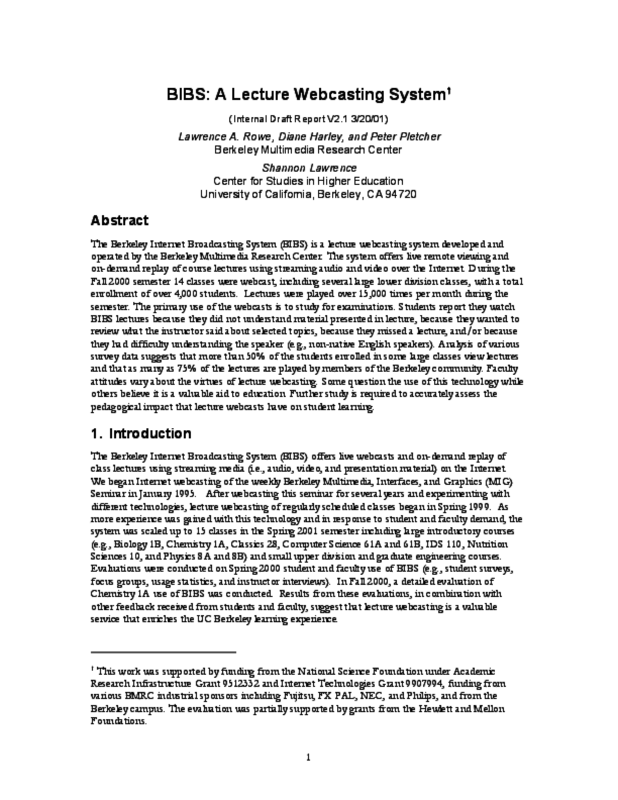 The Berkeley Internet Broadcasting System (BIBS) is a lecture webcasting system developed and operated by the Berkeley Multimedia Research Center. The system offers live remote viewing and on-demand replay of course lectures using streaming audio and video over the Internet. During the Fall 2000 semester 14 classes were webcast, including several large lower division classes, with a total enrollment of over 4,000 students. Lectures were played over 15,000 times per month during the semester. The primary use of the webcasts is to study for examinations. Students report they watch BIBS lectures because they did not understand material presented in lecture, because they wanted to review what the instructor said about selected topics, because they missed a lecture, and/or because they had difficulty understanding the speaker (e.g., non-native English speakers). Analysis of various survey data suggests that more than 50% of the students enrolled in some large classes view lectures and that as many as 75% of the lectures are played by members of the Berkeley community. Faculty attitudes vary about the virtues of lecture webcasting. Some question the use of this technology while others believe it is a valuable aid to education. Further study is required to accurately assess the pedagogical impact that lecture webcasts have on student learning.